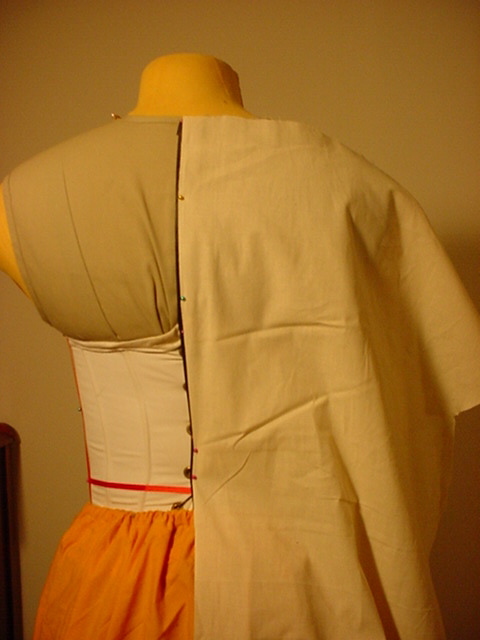 This is a very popular style of bodice amongst the english during the Elizabethan period. It shows a distinctive inverted arch to the neckline. Commercial patterns don’t seenm to ever do this. Not sure why — it’s a pretty fabulous look. A design sketch, showing seam placement and the rough arch depth. 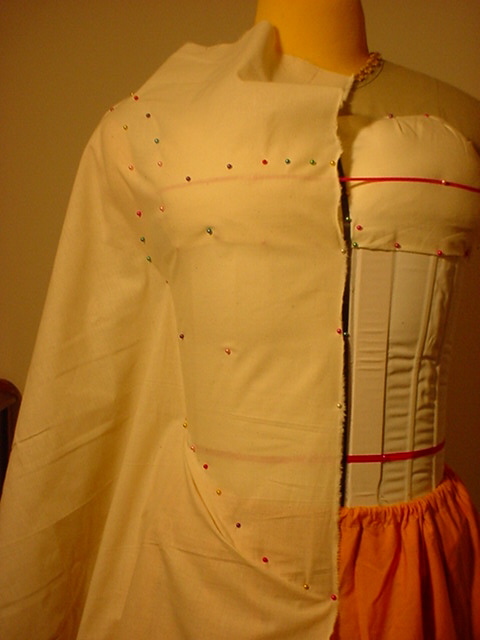 I start the bodies from the front, by pinning the straight edge of the muslin along the center front mark of the dummy. 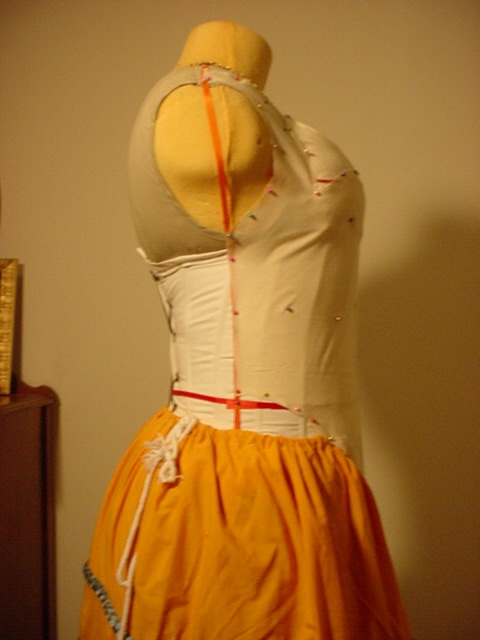 Next, I smooth the muslin over the dummy, pinning it down as I go along. 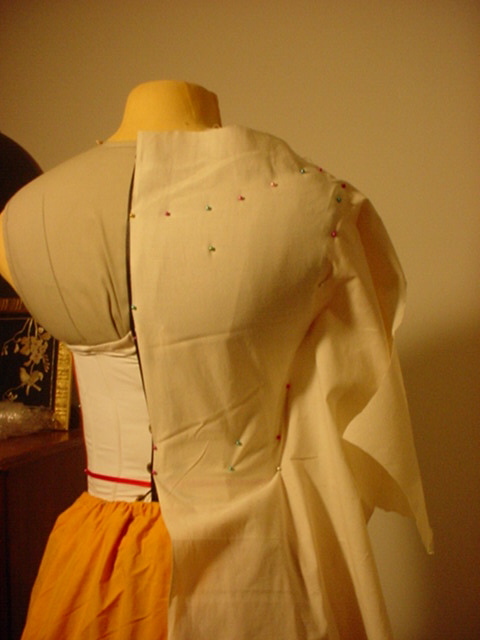 The muslin is slightly stretched at this point, so the pins are pretty necessary. 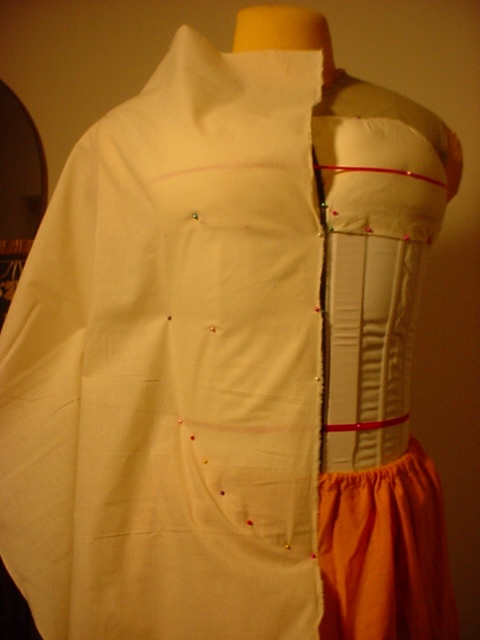 I’m pinning out the bottom curve of the bodice as I go — otherwise, you get some nasty wrinkles to deal with. The muslin is smoothed all the way over to the side seam. 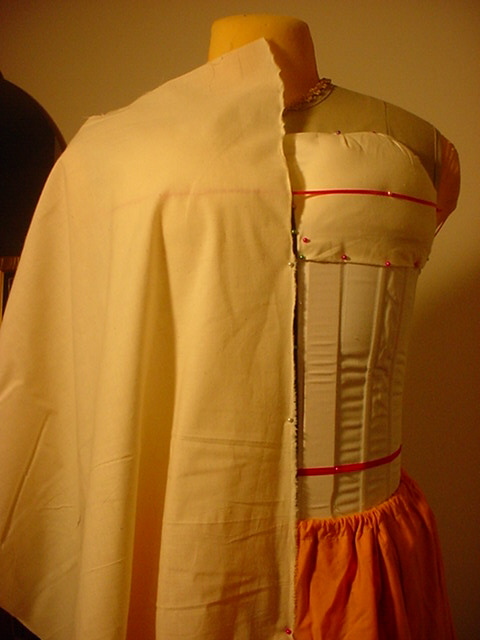 I’ve also finished the curve at the bottom of the bodice. I’ve pinned in the outline of the strap and arched neckline. 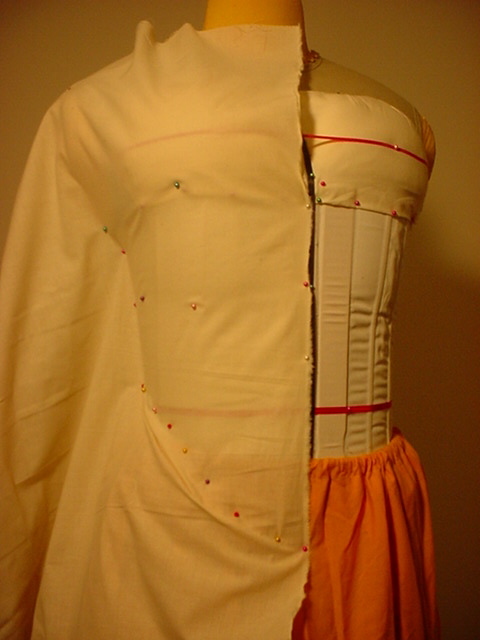 To make sure the neckline is right, I’m using my “modesty” mark (the pink ribbon pinned across the dummy’s chest). I can only stray below that at the absolute corner of the bodice (where the neckline meets the strap), and I want to make and arch that goes to about a half inch above the modesty line in front. The front piece of the bodies, trimmed along the pin lines. The front piece, after trimming, from the side so you can see the side seam and the curve around the armscye. I cut the armscye fairly high, because I find you get a better silhouette that way. Starting the back piece. 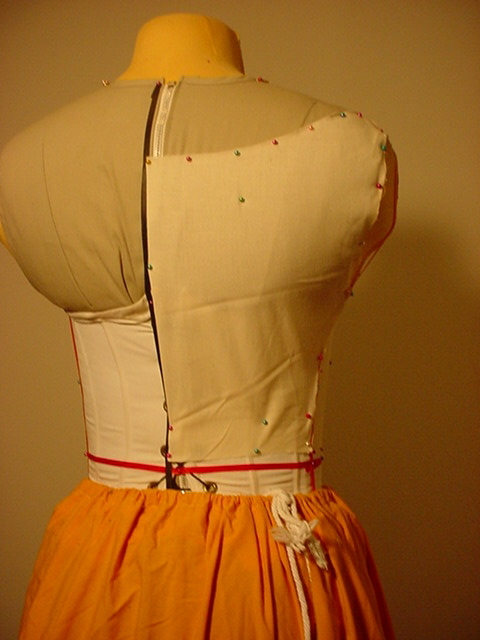 Again, I start by pinning a straight edge of muslin to the center line in the dummy. 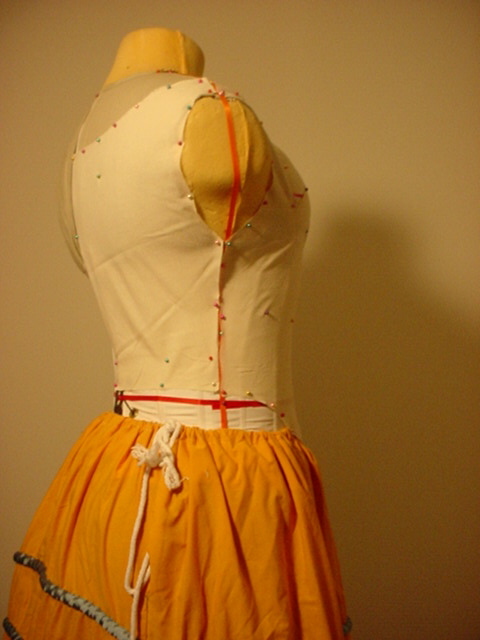 And, again, I’m smoothing the fabric over towards the side seam, pinning it down as I go. 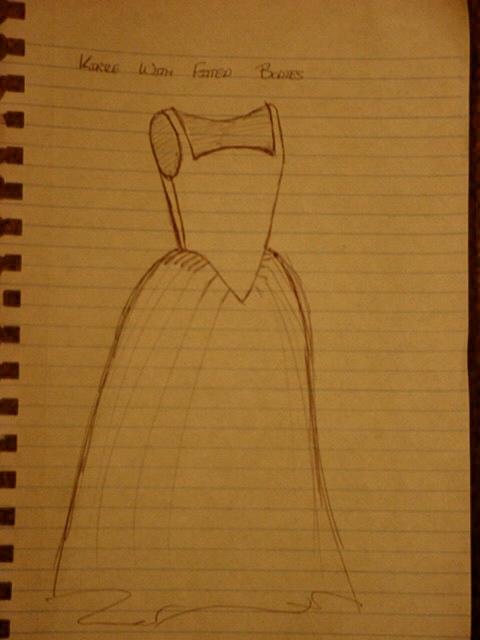 I’m also pinning in the back neckline (a shallow scoop) and the waistline as I go. The back piece, trimmed along the pin lines. Shown from the side, you can now see the full armscye. Period armscyes tend to be smaller than modern ones, and that’s an odd adjustment to make in your head when you’re making patterns.